Ominous Tremors At Mount Ontake Force Rescue Crews Off Volcano : The Two-Way More than 20 bodies remain on a Japanese volcano as new tremors force search teams to abandon their efforts. Officials don't yet know precisely how many climbers remain trapped on the mountain. 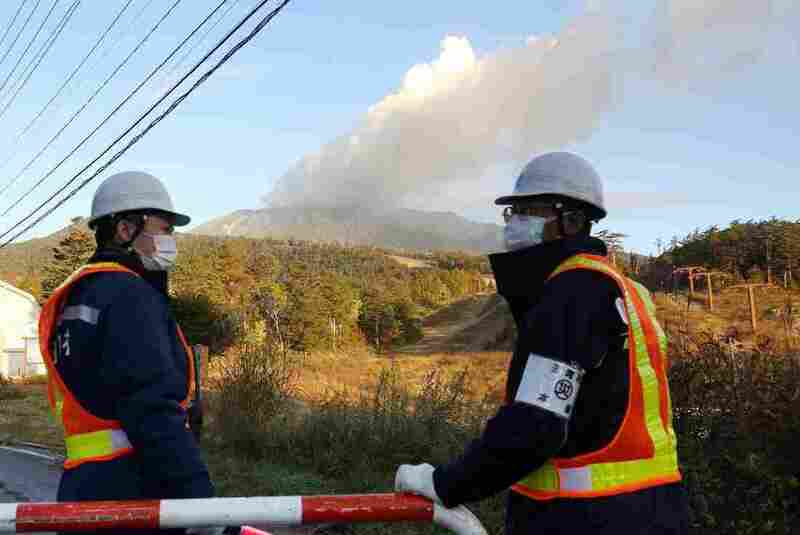 Security personnel guard the entrance of a road leading to a trail on Mount Ontake in Nagano prefecture Tuesday, three days after the volcano erupted in central Japan. More than 20 bodies remained near the summit of Japan's Mount Ontake as new tremors and venting gases forced search teams to abandon their efforts early Tuesday local time. Officials don't yet know precisely how many climbers were trapped when the volcano erupted Saturday, a busy day for hiking. "Weather officials say they've detected new seismic activity around Mount Ontake, which could trigger another eruption at any moment. Police called off search efforts at 7 a.m. Tuesday local time, citing heavy concentrations of toxic volcanic gas and threat of further eruption. "Even national guard helicopters, which would usually still fly after other rescuers retreated on foot, are now being grounded. "Authorities are continuing to warn local residents of falling debris and fast-moving gas clouds in a 2 1/2-mile radius of the several newly formed craters. Some 800 rescuers await a decision on whether to resume again tomorrow, although the chance of finding survivors is already slim." The Associated Press notes that "rescuers found five more bodies on Monday, bringing the death toll to 36. They have managed to airlift only 12 bodies off the mountain since the start of the eruption on Saturday because of dangerous conditions." As we've reported, more than 200 people made it safely down the mountain after Saturday's sudden and powerful eruption sent rocks and a huge cloud of ash down the mountainside. Before Saturday, the last large eruption at Mount Ontake, a popular autumn hiking destination whose summit is around 10,000 feet, was in 1979.